At Orthodontically Yours, we are dedicated to helping everyone achieve a smile they’re truly proud of. Our team is committed to helping each one of our patients obtain a smile they love in a comfortable, welcoming environment. We offer multiple types of braces to ensure that you get to choose the orthodontic treatment that suits your lifestyle - but whether you receive traditional braces or Invisalign, Drs. Kholov, Paradisgarten, and Abi-Nahed will most likely require you to wear a retainer to solidify your beautiful new smile. Orthodontically Yours offers three types of retainers, each of which serves a different purpose and has unique benefits. 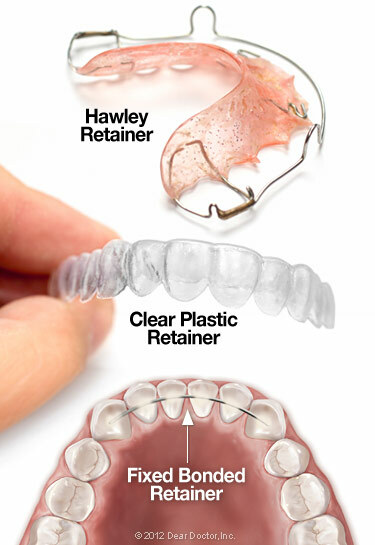 Hawley Retainer: This is the most common kind of retainer. Composed of a thin piece of acrylic that mirrors the shape of the roof of your mouth and a thin wire that runs along your teeth to keep them in place, it’s simple, affordable, durable, and very easy to correct to continue to make minor improvements. Clear Aligner: Clear retainers closely resemble Invisalign aligners or mouthguards. They’re made from thin, transparent plastic that’s molded to fit directly over your teeth. They’re invisible and easy to remove, which makes them well-suited for daytime use, but are slightly less durable than Hawleys and aren’t ideal for patients who grind their teeth. Fixed Retainer: Often called bonded lingual retainers, these devices simply use a small metal wire that’s cemented to the inside of the teeth to keep teeth in their proper places. While they’re not removable, fixed retainers are completely invisible and are great for patients whose teeth are at a high risk for moving back to their old positions. How Do I Adjust To My Retainer? Getting used to your new retainer shouldn’t take long, but you may find that for a day or two after receiving it, your mouth might produce more saliva than normal. You also may have a bit of a hard time talking normally. As your mouth adjusts to the new appliance, these issues should fade away quickly. How Long Do I Have To Wear Retainers For? After your braces come off, Drs. Kholov, Paradisgarten, and Abi-Nahed will fit you for retainers and provide you with a retainer treatment schedule. You will most likely be advised to wear your retainer full-time (both day and night, except for during meals) for six months to a year, and then only at night thereafter. Remember: wearing your retainer is the best way to preserve the beautiful smile that you earned with your braces! How Do I Take Care Of My Retainers?